Queens University of Charlotte is excited to be hosting the 2018 NCHO Conference here in Queen City. If you have not been to Charlotte in a while, you may not realize how much it has truly changed in the last 10 years. Our hospitality scene exploded after Johnson & Wales University opened in 2004 filling the city with chefs and entrepreneurs eager to elevate our food culture. Race fans rejoiced in 2010 with the opening of the NASCAR Hall of Fame. We brought back the Buzz in 2014 with the return of the Charlotte Hornets and finally made a home for our Knights in Center City. Charlotte is home to over 40 craft breweries and distilleries, over 20 museums and cultural venues in Uptown alone, and 11 professional and non-collegiate sports teams. 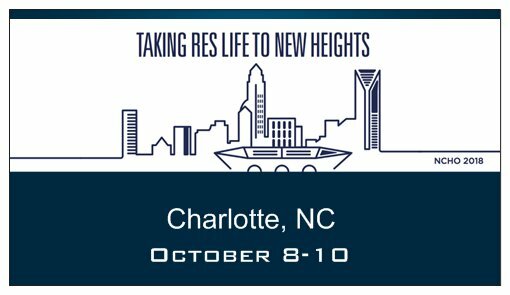 Inspired by the growth of our city over the last decade, this year’s conference theme is Taking ResLife to New Heights. Just as our city continues to develop to increase the quality of life for Charlotteans, so too must we aim for new heights as professionals to support the growth of our students and validate the powerful and important work we do. We are looking forward to showing you the new and improved Charlotte as we learn about the progression and transformation of Housing and Residence Life programs across our state. The conference will be hosted at the Fairfield Inn and Suites in Uptown Charlotte, just blocks from dozens of restaurants, museums, art galleries, and parks. We look forward to seeing you in the Queens City October 8-10, 2018! Register for the 2018 NCHO Annual Conference today! Are you a vendor? If so, please click here! The Fairfield Inn & Suites Charlotte Uptown is offering a discounted rate of 169.00 USD per night for NCHO registrants as well as discounted $10.00 overnight parking / $5.00 daily parking. Click here to Book your group rate for NC Housing Officers Association or contact Ashley Busman at abusman@aurohotels.com. So – make sure you block off October 8-10, 2018 (Mon-Wed) on your calendars and come on out to Charlotte, NC! We’re looking forward to having you!